Wonder Woman returns to the Hall of Justice in time to learn of the prison break, and witness Doomsday's descent to Earth. 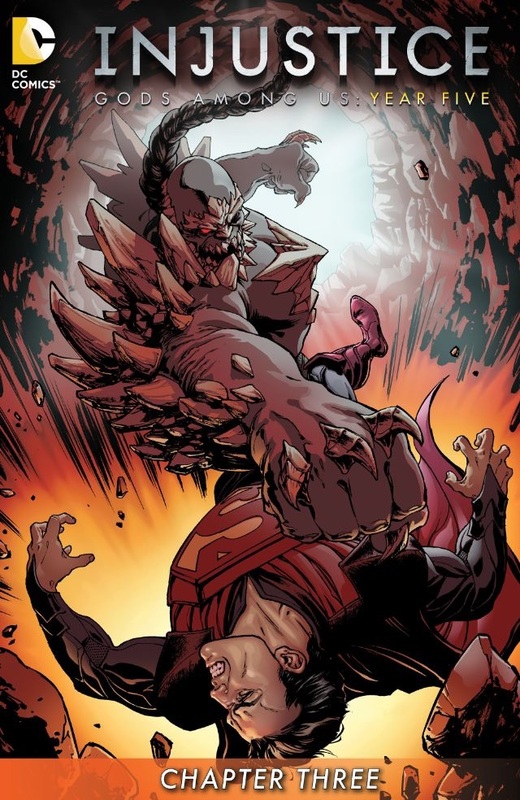 She flies to aid Regime Superman in his battle with Doomsday, but Bane enters the fray, and provides Regime with assistance, allowing him to defeat Doomsday. Bane expresses his desire to join Regime and help him find the Batman. Wonder Woman is hesitant, but decision can be made, as Regime needs to dispatch the Parasite. Bane's addition to the League is met with resistance, but Regime asserts that his decision is final, and he'll brook no opposition to it. The chapter ends with a figure flying to Ingolstadt, Germany who has a bizarre resemblance to Superman. Story - 2: Despite the excessive decompression of Injustice, there are moments that come through well, and Bane is one of them. Bane remains in character, an antagonist for the Batman, and a man looking at his surroundings carefully, then deciding what works best... for him. That bit of structure doesn't last long, as we see Bane restrain Doomsday in a full nelson, and Regime Superman knock the monster out. It's one thing for Doomsday to be no threat to Regime, but another when Bane, even on Venom, has the strength to hold him for any length of time, let alone give Doomsday any type of pause based on the abilities Bane possesses. This is when, and it often happens, Injustice becomes its namesake, a video game where Green Arrow can fight Doomsday and win, if the buttons of the controller can be pressed fast enough in the right combination. Doomsday is little more than an annoyance, and like Lobo, devalued to a caricature of what he could be. Wonder Woman and the rest of the League's resistance to Bane is tellingly blind, as he is no different from Regime, with the exception of the throne Regime sits upon. The fact that Bane can be recognized immediately as a villain, is compounded by the truth before them: the League cannot see the villain that leads them, nor the villains they've become, and it's confounding as to why. Perhaps only Flash and Shazam are truly aware of what is transpiring, yet they continue to enable the situation, with the delusion that somehow Regime will return to his once noble self, though he shows definitively that such a return will never come. Three issues in, and Year Five has yet to form past the Plot Coupon premise that it has been shakily formed on. Year One presented the downfall, while the following showed battle with the Insurgency, Magic, and the Gods, respectively. However, aside of having to catch them all, there is no thrust to this Year's actions. Batman still wants to take out Regime, and Regime still wants to be rid of Batman, but much in the same way of the olde Masters of the Universe cartoons. There was always a portal waiting for Skeletor to escape into, and because of this, you knew that the villain would never be caught. The object was to provide enjoyment outside of that short-coming, which was needed to prolong and present more stories, and MOTU was able to do so. The sword that hangs above Injustice is the clear fact that Regime Superman can end this all anytime he wants to. Much as he decided to no longer be bothered with the Parasite, and chucked him into the sun, Regime could do the same for the escapees, and his greatest annoyance, the Batman. There's no where on Earth that the Batman could hide from him, and it's silly to think that Batman could even sit in a public café safely, when he's literally the most wanted man on the planet, by the most powerful man in the world. Art - 4: Derenick always gets me through even the worst Injustice chapters and he does it here again. Cover Art - 4: The sad thing about the cover, is the cliché it proves.